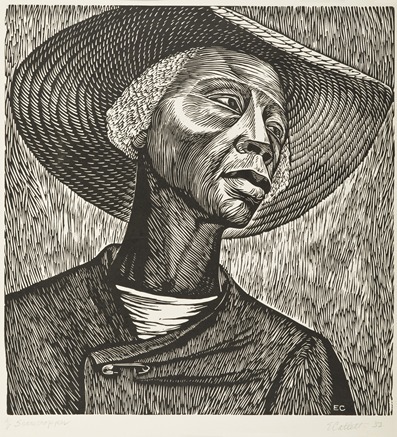 Last month the newly formed American Art Acquisitions Group voted to acquire Elizabeth Catlett’s Sharecropper, a graphic masterpiece. A sophisticated and virtuosic pattern of cuts into the linoleum block create the striking energy and clarity of this print. Catlett, who is the granddaughter of slaves and just celebrated her 96th birthday in April, was first introduced to the linoleum cut, or linocut, in 1946, when she apprenticed at El Taller de Gráfica Popular in Mexico City (The People’s Graphic Workshop). The artists’ collective (Catlett was a member from 1946 to 1966) influenced her commitment to create art that would promote social change and be accessible to broad audiences. Prints, in particular linocuts, were the workshop’s specialty and became Catlett’s preferred medium: they were inexpensive, easy to incise, and conducive to publishing large editions. The linocut is also aesthetically appealing for its smooth, uniform, and clean surface qualities. Sharecropper, first created in 1952, is one of Catlett’s most iconic works, and the version just acquired for LACMA is the artist’s proof—the first impression pulled by the artist. The vivid contrasts of the black and white markings creating the sharecropper’s weathered skin, textured white hair, and broad brimmed straw hat framing her face are direct and vigorous—and contrast with fatigue evident in the eyes and the large safety pin neatly holding her lightweight jacket closed. These details allude to hardships of the life of a sharecropper. Sharecropping was an agricultural system that emerged in the U.S. immediately following the Civil War. Laborers worked plantation lands, usually cotton fields, in exchange for a portion of the crops, but typically the proceeds from the crops were allocated to the landowners in advance for expenses, such as housing on the plantation, now required of the farmers. For formerly enslaved African Americans, this exploitative system created extensive and ongoing disenfranchisement. Catlett’s image does not shy from this history, nor have other artists throughout the history of American art since Reconstruction. In fact, Sharecropper demonstrates the persistence of this theme, namely picking cotton, in American art for both African American and Caucasian artists, including, from LACMA’s collection, Winslow Homer (The Cotton Pickers, 1876), Thomas Hart Benton (Cotton Pickers, 1931), and John Biggers (Cotton Pickers, 1947). However, Catlett’s Sharecropper is now the American art collection’s most modern image of American sharecroppers, and one of the artist’s innovations was to remove any visual reference to the cotton field or bags. As a result the image appears more universal and heroic, a portrait of the everywoman sharecropper to whom we look up but who does not meet our gaze. Sharecropper in on view now in our American art galleries. This entry was posted on Wednesday, August 3rd, 2011 at 10:05 am and is filed under Uncategorized. You can follow any responses to this entry through the RSS 2.0 feed. You can leave a response, or trackback from your own site. Is the new piece on display? and is there a viewable collection of the American Art Acquisitions Group? As always, keep checking out our blog Unframed for any news on our permanent collection and more! I was stunned when I scrolled down the page and saw this. It grabbed me and held my gaze. this is a serious ‘true’ art piece, done by an artist with the skill of a master. there is energy, vibe, technical skill, fluidity, hardness, softness, and a infiniteness about the piece. I have recently been checking out a lot of old japanese woodcut prints and this piece is very very good. It is amazing to look around in this piece to see all the different areas that were cut ‘just so’ to achieve a shade, or tone. Can’t really say enough about it. If it was on my wall I would stare at it at length. I would really enjoy seeing more of Catletts work. The skill of it stunned me. what is the image size of Catlett’s “Sharecropper”? Rest in Peace and thank you for all your contributions! The sharecropper captured my interest years ago. I have never tired of admiring the print. It is unique.